Under section 43(1) of the Police Service Act 2003 the Commissioner must establish procedures for the investigation into any alleged breach of a provision of the Code of Conduct by a police officer. The procedures established by the Commissioner are contained within this document, ‘Abacus – Commissioner’s Directions for Conduct and Complaint Management, and Compliance Review’. Members must comply with these Directions. Abacus applies to members but not to state service employees (SSEs) of the Department of Police, Fire and Emergency Management (DPFEM). Matters relating to SSEs employed within Tasmania Police business units are directed to the Deputy Commissioner for referral to Business and Executive Services (BES). They are managed through a separate framework. Abacus is a centralised reference document that brings together all of the information relevant to the management of conduct, complaints, and compliance matters. It is publicly available to ensure transparency and clarity for both members and the public. It will be amended as required to ensure the information is contemporary. Policing, like any service to the public, attracts complaints. The unique nature of policing involves resolving emotionally-charged incidents and crises every day. Complaints arise from only a small proportion of interactions with the community. A robust and accountable complaints system is the hallmark of a corruption-free policing service and is the key to organisational learning and development. However, complaint numbers alone are an inadequate guide to measuring community satisfaction levels. Abacus is designed to ensure that matters are dealt with at the earliest opportunity and by the appropriate level of the organisation. This is in everybody’s interests; complainants, the community, subject officers and Tasmania Police. Abacus also provides procedures for the management of breaches of the Code of Conduct and other matters that do not arise from complaints. 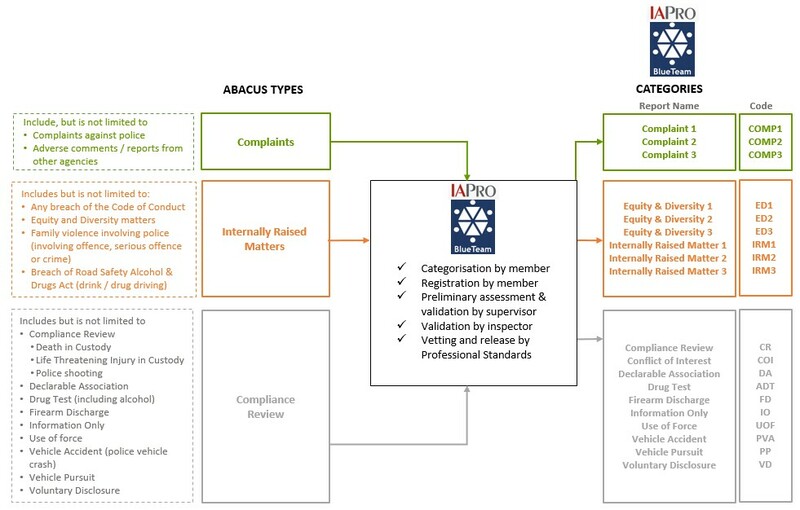 The management of internally raised matters (IRM) through Abacus provides supervisors with a toolkit of options for addressing conduct and performance problems, preventing their continuance and initiating Continuing Professional Development (CPD) for members. This assists supervisors to perform the pivotal task of personnel management. Transparency in these procedures – and the rationale underpinning decisions – is fairer for members. High-risk and hands-on activities are necessary for the delivery of policing services, including use of force and vehicle pursuits. Such activities need checks and balances for public confidence and identification of any legislative, policy or training gaps. The compliance review aspect of Abacus means that these activities are centrally recorded and follow a consistent reporting process. Compliance review also helps to identify opportunities for organisational learning. Compliance Review matters are assessed for adherence to instructions, directions, orders and procedures. If, after preliminary assessment, a possible breach of the Code of Conduct is identified, the matter will be managed in the same manner as an ‘internally raised matter’. Complaints are reported to Tasmania Police from a range of sources including private citizens and their representatives, other police, other Government agencies and Members of Parliament. Methods of complaints include in person and by telephone, letter or e-mail (see also acceptable formats for complaints). All Abacus matters are recorded on IAPro/BlueTeam. The following diagram shows the link between the Abacus types and the IAPro/BlueTeam categories. Tasmania Police is committed to the Police Officer Oath / Affirmation, the Tasmania Police Values, the Tasmania Police Guiding Principles, the National Police Code of Ethics and the SELF Test. These are described below. We value integrity because we believe in honest, professional, transparent and ethical behaviour in all aspects of our business. We value equity because we believe in fair, consistent and inclusive behaviour when interacting with our people and our community. We value accountability because we believe in being answerable for our decisions, actions and omissions, behaving professionally and being responsible for our outcomes. 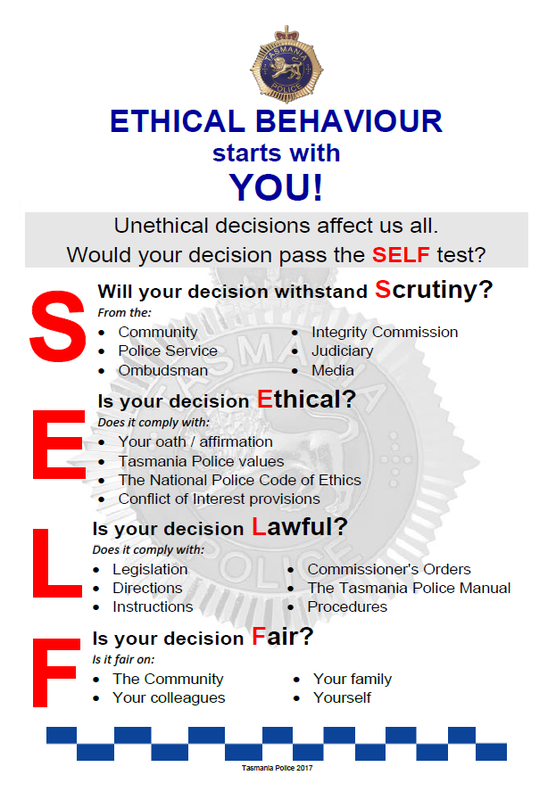 Tasmania Police Values are the foundation for the types of ethical behaviour expected from members. This behaviour is demonstrated in all aspects of work including the delivery of services to the community and in interactions with each other. All Abacus matters will require consideration of the extent to which a member’s conduct is inconsistent with one or more of the organisation’s values. It is important to remember that “the standard you walk past is the standard you accept”. Police officers have a duty to their country and to their Police Service to serve the community by protecting life and property, preserving the peace and detecting and apprehending offenders. Police officers should carry out their duties with integrity and honesty and should at all times make every effort to respect the rights of all people in the community regardless of colour, social status or religion, enforcing the law justly without fear, favour, malice or ill-will. It is incumbent upon all police officers to keep confidential matters of such a nature which they may learn in their official capacity, unless revelation is necessary for the administration of justice. By their conduct and performance police officers should give high priority to enhancing the reputation of their profession. Police officers should practice self-discipline and restraint and should strive to improve their knowledge of the law and contemporary police practice applicable to their community. In the pursuit of their responsibilities, police will resort to the use of force only when strictly necessary and to the extent required for the performance of their duty. Police officers should be aware of these ethics and should accept the desirability of them as an integral part of their personal and professional life. The term ‘public interest’ has been described as considerations affecting the good order and functioning of the community and government affairs, for the well-being of citizens. It is also expressed as ‘for the common good’. What is in the public interest is incapable of precise definition as there is no single or absolute public interest; it can be easier to generalise about what is not in the public interest rather than what is in the public interest. Public interest is an ideal that is central to the concept of democratic government and administration. Acting in the public interest means carrying out official duties for the benefit of the public served by Tasmania Police, in a fair and unbiased way, and making decisions that are not affected by self-interest, private affiliations or the likelihood of personal gain or loss. The public interest, and community confidence in Tasmania Police, is underpinned by confidence in an effective and transparent conduct, complaint and compliance review system. These procedures are framed by the Police Service Act 2003. Sections 42 and 43 contain the Code of Conduct and actions relating to breaches. Sections 44 to 47 cover complaints against police; dismissal, conciliation, and investigation of complaints; and determination to take action against breaches of the Code of Conduct. Allegations involving the commission of an offence, serious offence or a crime by a member will be investigated under the relevant legislation (e.g. Road Safety (Alcohol and Drugs) Act 1970, Police Offences Act 1935, Criminal Code). This is in addition to being considered as a potential breach of the Code of Conduct. The principles of procedural fairness apply to all Abacus matters. It is equally important that Abacus is as fair to complainants as it is to members. A fair process for all includes accessibility to make a complaint, transparency of Abacus procedures, regular updates (unless provision of updates hinders evidence gathering) and communication of findings to both parties. Members and complainants are more likely to support a system if they feel it is fair. Even if they disagree with the outcome they are more likely to accept it if they feel the process has been fair. The member has a right for their reply to be received and considered before a final decision is made. Hearing both sides of the story is critical to good and ethical decision-making. However, procedural fairness does not entitle the member to test all of the evidence or to test the processes and methods of the investigation. More information is under The Inquiry / Investigation Process. Level 1 Abacus matters are dealt with informally and locally and there are no disciplinary outcomes (only CPD opportunities). In practice this means that minor matters such as incivility can be dealt with quickly as there is no investigation or lengthy process. Dealing with minor matters proportionately is fairer for everybody and allows for appropriate resources to be allocated for the timely resolution of more serious matters. Procedural fairness for level 1 matters includes complainants and members being spoken to, however the resolution is not weighed down by adversarial processes. For level 2 and 3 Abacus matters, unless it is prejudicial to the handling or outcome of an inquiry / investigation or there is an overriding public interest, the member should be informed of the matter by the inquiring / investigating officer as soon as practicable following registration on IAPro or BlueTeam. The member should be informed of the case to answer and given an opportunity to reply before a decision is made that may adversely affect them, including section 43(3) Actions under the Police Service Act 2003.
actual: an actual conflict of interest arises when there is a conflict relating to the members current actions or decisions. An actual conflict of interest can be managed and monitored to prevent a conflict of interest contravention occurring. perceived: a perceived conflict of interest occurs when a reasonable person, properly informed, would consider that a member’s personal interests could improperly influence or may have improperly influenced that member in the performance of their duty. potential: a potential conflict of interest exists where the personal interests of a member could influence their duties in the future. The interest may currently exist but have no impact upon the performance of the member’s duties at the present time. A potential conflict of interest can be monitored to reduce the likelihood of it becoming an actual conflict of interest. It is not always possible to avoid a conflict of interest and a conflict of interest is not necessarily unethical or wrong. The important thing is to identify the conflict, disclose it, and then manage it or avoid it if possible. If the member receiving an Abacus complaint or IRM believes they have a conflict of interest, they must continue to take the complaint and register it on BlueTeam, making a note of the conflict in the entry. If a subject officer believes that an inquirer / investigator or authoriser has a conflict of interest that should preclude them from involvement in the matter, they must provide written advice detailing the conflict. If a supervisor or manager is engaged in a managerial resolution of a level 1 matter, they must consider whether a conflict of interest exists and if so, record it on the relevant BlueTeam matter. If they are of the view that the conflict precludes them from resolving the matter they must advise their manager. If an inquirer/investigator identifies a conflict of interest at any stage in the Abacus inquiry / investigation process (levels 2 and 3) they must inform the authoriser. Similarly the authoriser must notify their manager if they have a conflict of interest in an Abacus matter. Members have a duty, under section 42(5) of the Police Service Act 2003 to disclose, and take reasonable steps to avoid, any conflict of interest in connection with his or her duties. At the conclusion of the process a section is included in relevant templates where the inquirer / investigator and authoriser are required to make a declaration in relation to conflicts of interest. The supervisor or manager who is informed of a conflict of interest must assess the circumstances and determine an appropriate course of action. A matter may be reassigned if required, however this is not the default course of action and should only occur when the conflict of interest would compromise procedural fairness. The supervisor or manager must update the BlueTeam running sheet to record the advice and the directions given to the notifying member. Part 1.47 (Conflict of Interest) of the TPM provides further information. Members must not perform the role of inquirer / investigator or authoriser in a matter where they are a subject officer or witness officer as this is an insurmountable conflict of interest. All members involved in the management and resolution of Abacus matters must maintain appropriate confidentiality. The ‘Need to Know Principle’ applies to these procedures, i.e. information should only be available to those who need to access that information to do their work. It is accepted that in some circumstances this will mean that members are required to notify a senior officer/s, People Support, a support person, and/or the Police Association of Tasmania. As with other Tasmania Police systems, use of IAPro is auditable. A usage log is attached to every IAPro matter and every access is recorded. Any breach of this provision will be viewed as serious and will be dealt with as a fresh Abacus matter. In some cases the need for confidentiality may extend to not identifying the complainant to subject officers and witnesses. They also may not be provided with full copies of a complaint, statutory declaration or transcribed interview. Reasons for this include protecting the complainant and any other member against whom allegations may have been made. Anonymised information may be reported under authorisation from the Deputy Commissioner or Professional Standards Commander for the purpose of organisational learning. The standard of proof for Code of Conduct matters is the balance of probabilities. If a matter is dealt with by a Magistrates Court or Supreme Court then the standard of proof is beyond reasonable doubt. as both a potential breach of the Code of Conduct and as a potential offence, serious crime or crime. The reason that different approaches may be taken is because the Code of Conduct exists to facilitate discipline within Tasmania Police and to ensure that appropriate standards are maintained. This is in accordance with the Commissioner’s legislated obligations for the efficient, effective and economic management and superintendence of Tasmania Police. The approaches are further explained below. Abacus decisions relating to level 1 matters are made on the balance of probabilities which means more probable than not. They are not dealt with as potential breaches of the Code of Conduct, however there is still a decision about whether or not the alleged behaviour from the subject officer occurred. If so, the subject officer should be given CPD or the matter may be resolved by informal resolution or formal resolution. If the matter is resolved by informal resolution the outcome is recorded as ‘informal resolution’. If the matter is resolved by formal resolution then the matter is recorded as ‘formal resolution’. As above, Abacus decisions relating to breaches of the Code of Conduct are made on the balance of probabilities which means more probable than not. It is accepted across Australia that this standard of proof (the ‘civil’ standard) is to be applied to internal disciplinary matters. The criminal standard of proof, beyond reasonable doubt, applies to matters where a member is being prosecuted. It is important that members understand that an inquiry/investigation into whether or not a member has committed an offence, serious offence or crime may also involve consideration of whether or not that member has breached the Code of Conduct. Any prosecution will apply the criminal standard of proof, beyond reasonable doubt. Whether or not the member is convicted of the prosecution, any identified Code of Conduct breach will be separately determined on the balance of probabilities. the motivations of witnesses including the complainant. In situations where the only evidence is one person’s word against another’s, the balance of probabilities standard of proof is not met and the allegation is not proved. 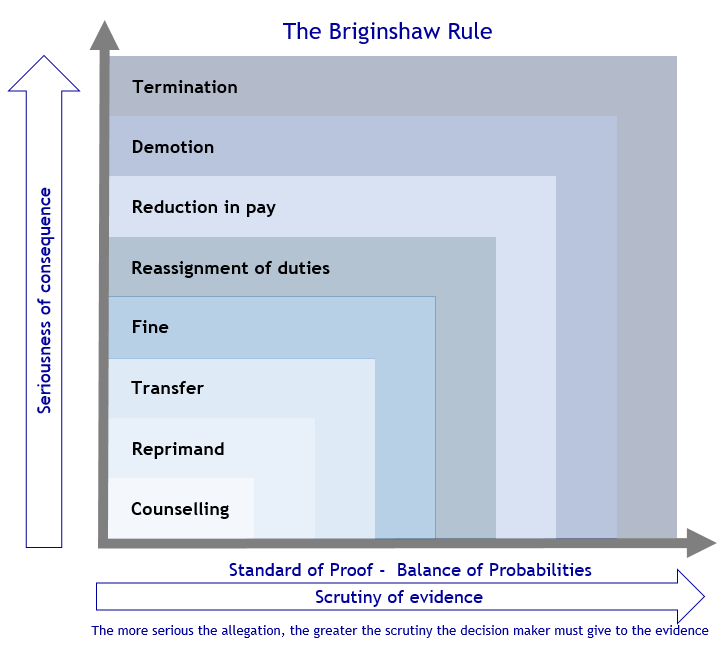 While the balance of probabilities means more probable than not, the test in the Briginshaw case emphasises that for serious allegations the decision-maker must closely scrutinise the evidence on the balance of probabilities not just by applying a mere mechanical comparison of probabilities, but rather by feeling persuaded that the alleged behaviour occurred. Unclear testimony or circumstantial, uncorroborated or inexact evidence would warrant a closer scrutiny to determine if there is anything else to substantiate the allegations. If no further evidence is identified, then on the balance of probabilities it did not occur. Serious allegations are those where there is a significant amount at stake for the member (e.g. allegations that may amount to demotion or termination of employment). The more serious the allegation and potential consequences, the stronger the evidence is required for the decision-maker to be satisfied, on the balance of probabilities, that the incident occurred. The diagram below provides an illustration of this. For state service employees refer to Employment Direction No.5: Procedures for the Investigation and Determination of Whether an Employee has Breached the Code of Conduct. Managing Conflicts of Interest in the Public Sector Toolkit ICAC and CMC 2004 p vi, www.integrity.qld.gov.au (accessed 14 February 2017). This page -- https://www.police.tas.gov.au/about-us/abacus/1-objectives-principles/ -- was last published on March 1, 2018 by the Department of Police, Fire and Emergency Management.